BH5441 - Lillehammer Lodge is a fabulous 5 bedroom town-home that sleeps 11 - 12. It is in the heart of Bear Hollow Village, located at the base of the Utah Olympic Park. Park City Resort has now combined with the Canyons so the base area is only 2 miles away. Deer Valley is 7 miles and there are four other resorts within a 45 minute drive. The free shuttle stop that will take you to Park City or Deer Valley is just a 2 minute walk. This spacious town-house has a large fully equipped kitchen, dining room with an expandable table (seats up to 10), family room with new large HDTV, downstairs private den with full bath, and a private hot tub and gas BBQ on the deck. There is an attached 2 car garage with additional space in the driveway and parking on the street. The town-house has a spacious open floor plan with 5 different sleeping areas. The master suite (Bedroom #1) has a King bed and a balcony with a great view of the mountains and ski-areas. Entertainment options include a new 46 inch HD TV, Wii and X-Box 360 video game players, and a BOSE sound system compatible with your iPhone. There are also 6 pairs of boot dryers. No more drying ski and snowboard boots by the fireplace and hoping they'll be dry in the morning. Also, you won't have to remove your boot liners every night. There is a full size washer/dryer in the property. The free shuttle stop at the entrance to Bear Hollow is a short 2 minute walk. Great restaurants and shopping are only a half mile away in the Redstone shopping area. The town-home is close to the Tanger Outlet Mall and about a 7 minute drive to old town Park City. We made several ski and hiking trips to Park City and fell in love with it. Park City is a great ski town and is also a fantastic family summer vacation location. Park City is a year round playground for anyone who loves the mountains. 2 car attached garage with additional space in the driveway and additional parking on the street. Expandable table that seats up to 8, plus 2 more at the breakfast counter. There is also a folding table in the closet to seat as many as four more. Beautiful views of the mountains and ski areas from the balcony off of the master bedroom. Amazing condo and so close to resorts and downtown! This was a great place to stay. Larry and John were great to work with. John was very responsive and helpful with everything. Condo had a great layout and easily fit our large party. Canyons entrance was only 2 minutes away and park city entrance was 8 minutes away and deer valley was 15 minutes away. Very close to shopping and grocery stores in Kimball junction also. Maybe a 2 minute drive. Overall we loved the place and would definitely recommend to anyone and would stay there again! We stayed at this home in February 2019. 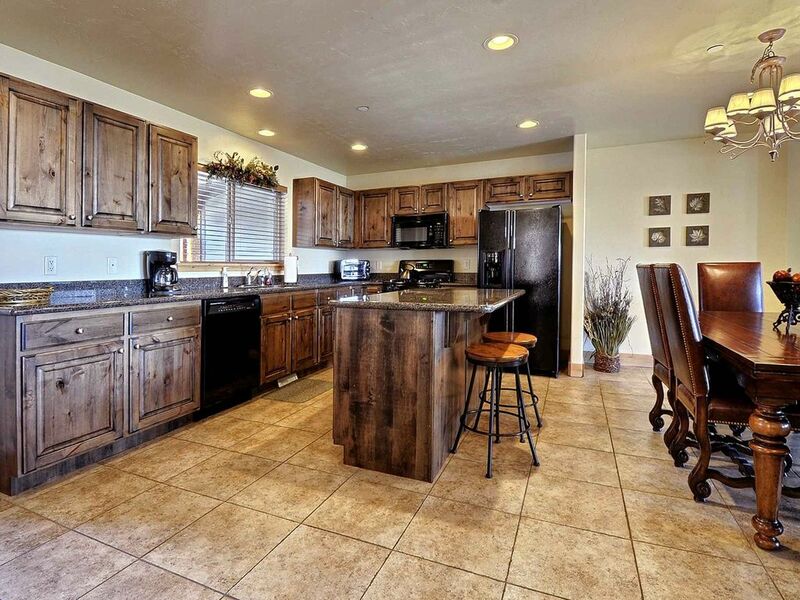 Overall, the location is fantastic, so close to the mountains and grocery store. The house is fully stocked and the beds were comfortable. The property managers are wonderful and very easy to work with. The home was listed with five bedrooms and that's just inaccurate. They put up a curtain in the basement and we tried to make it work but my brother barely slept. It was cold and the fan for the generator down there was going on all night. He ended up moving to a hotel after the first night. There's one bedroom with bunk beds. It's a little small but otherwise the three other bedrooms are a comfortable size. The family/great room area was wonderful and we enjoyed a lot of time by the fire and making dinner each night. This is a really nice home, especially good for a ski vacation. It is clean, large and the rooms are well spaced. We especially liked the extra "suite" in the basement, gave us a lot of extra flexibility. Close to ski slopes and shopping, can't beat it! It was close to everything we needed. Very clean and kept up. 2. If you are going in summer months, be prepared, this unit has no AC, which was difficult because by late day, the top floor bedrooms are well over 80 degrees, and do not cool back off until 1-2AM with windows and fans open to try and circulate air. The AM's were fine, but around noon, the house slowly heats up more and more until it becomes stifling. Nicely appointed home. Owner was very attentive to making sure our stay was smooth.